I think I’m in denial we’re already here – and by here I mean 11/12ths of the way through 2016. I love this time of the year – especially all the gatherings and all the traditions. But, honestly, this year has been so speedy. I have managed to write our year-in-review Christmas letter and order several gift ideas after basically having no inspiration. But, wait, there’s plenty of time to talk about Christmas. For now, let’s look back on November, which was an insanely busy but good month for Team Taylor. 1. Even though I’m naturally a plan-in-advance multi-tasker, sometimes life requires one thing at a time. Our calendar has been jam-packed since we had our alma mater’s Homecoming, which involved out-of-town friends coming into our town. There was our church’s fall party at our house, a new volunteer opportunity before church one Sunday, our church’s annual shoe box packing party with more organization than ever before, hosting more dear out-of-town friends for our eighth annual Thanksgiving with friends, Ben’s birthday party that was supposed to be a bonfire but got turned into a flashlight tag party that ended up getting rained out and moved to Gatti’s Pizza, and our much-anticipated Disney cruise. Plus there’s ordinary home and school life and socializing with friends, many of whom are in transitions of their own. Usually I have much more Christmas shopping in the bags and a year-in-review letter ready to mail. But at this point I’m glad to have survived and enjoyed November. 2. Likewise, sometimes plans change. Okay, amend party plans: flashlight tag, hot dogs on grill, and s’mores bars and cookies. Then there was a 90% chance of rain during the party time. When you’ve got almost 20 kids coming over, you need better odds. Or a better plan. We are talking about a boy party, so it’s not like I could go to the craft cabinet and full out some activities for everyone to sit around the table and do – at least not for my boy. And that’s okay. But I needed a new party plan. I reminded myself what mattered. My boy loves people and parties. He was excited about the possibility of playing games at a local pizza restaurant when my husband mentioned that the morning before the party. I dismissed it, like I have a bad habit of doing, and then a couple hours later thought better of it. So I called and reserved us some tables and then texted the new plan to people. Disregard the cute invitations I sent. Forget the cute themed desserts I had planned. Cue the store-bought cookie cake I just bought for my boy who doesn’t actually like cake. I realized this change in plans was like coming up for air and letting go. And we still celebrated our boy who is always up for adventure. 3. 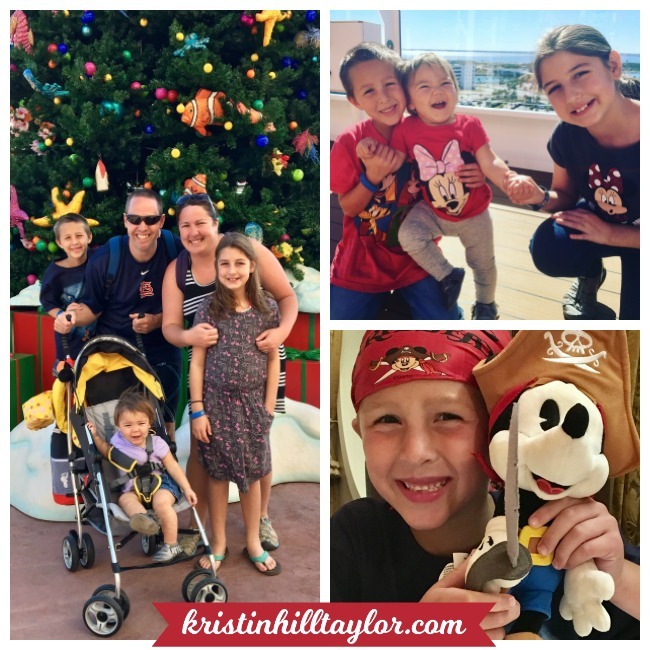 Disney does hospitality so well down to every last detail – and we loved our Thanksgiving cruise to the Bahamas aboard the Disney Dream. I’m working on posts about this, but for now let’s go with: We loved it. We are likely to go again sometime. And while I’ve heard others say a cruise trumps a trip to Walt Disney World, I’m going on record with this: They’re different kinds of trips, although certainly worth experiencing. 4. A cell phone and social media break for the four days we were on the cruise ship was exactly what I didn’t know I needed. I signed up for Facebook in September 2007, and I don’t think there’s been a day I haven’t at least briefly scrolled through my news feed. I love it because I love connecting with people and sharing information, but Facebook – and social media and society – have been so loud lately. I had brief and very limited WiFi and responded to a couple texts and emails regarding my lake house management job, but otherwise I only used my iPhone as a camera and for the on-board cruise app that worked on free WiFi. 5. The Summer Infant 3Dlite Convenience Stroller was an excellent purchase. I’ve been hauling around a jogging stroller that I bought used last year and am so glad to have a smaller option. We sure did break it on our cruise to the Bahamas. 6. I’ve enjoyed catching up with Olivia Pope and company recently. When she was kidnapped a couple seasons ago, I got annoyed and stopped watching. (It wasn’t the actual kidnapping that bothered me as much as how the story lines seemed to be stalling.) Absence must have made my TV-watching heart grow fonder of Olivia, Fitz, and their friends (and enemies) because I’m not annoyed with them now. Except I sort of am with Fitz & Olivia, but not in a way that makes me want to stop watching. 7. The new “Gilmore Girls: A Year in the Life” is good – although not great. Too often sequels and reboots seem like after thoughts. This one really does seem like we’re catching up with TV friends, which in this case means enduring some nonsense (hello, musical) and slow moments of not understanding why a well-educated Rory hasn’t matured as much as those around her. How was your November? What are you thankful you learned? 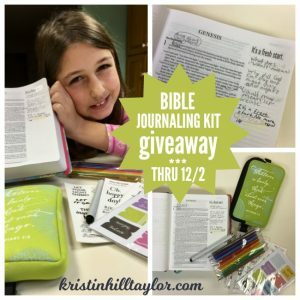 Be sure to check out the Bible journaling kit review Cate, 9, shared on the blog earlier this week. Plus you’ve go through Friday, Dec. 2 to enter to win a Bible journaling kit of your own! I’ve heard Disney cruises are the.best. Who is Olivia Pope – is this a series I should be watching? Gilmore Girls…never did like that show but I did try to get through “WINTER” – I just don’t like the sexual undertones, the language (Christ is my Savior – hello? ); the nonsensical buddy-buddy relationship between mom and daughter. I’m sure it’s my age but there’s just something wrong with that whole show. Thank you for the rant opportunity. I do LOVE your family and listening to all your fun adventures. Team Taylor Rocks! I would go on another Disney cruise tomorrow. It was excellent. I started working on a post dedicated to all those details. So, stay tuned! 🙂 Olivia Pope is from “Scandal.” Like I said, it’s good but I had to take a break for few seasons. I totally get your points about Gilmore Girls. The buddy-buddy relationship with them probably isn’t healthy and the reboot was more skanky than the original. And you can rant here anytime. 🙂 Love you! Love your thanks list here and for hosting this week, Kristin! I have friend who did the DIsney thing finally and say they love it so much they want to go back. They super planned with wristbands and all so their trip was awesome and they didn’t do the whole waiting in line thing. Oh, yes, we did Disney World two years ago, and it’s such a fun vacation. You put in the planning before hand and then when you get there it actually feels like a vacation. The cruise was the same way! Disney does hospitality right! Thanks for being here, Meghan! Such fun memories! Rachel licking that dolphin is a collective favorite memory for us. She’s so funny! 🙂 I’m glad to be home for all the Christmas festivities – I love this time of the year! Linking up my November recap post, and so thankful to hear that you are also in a state of denial about the calendar. How in the world . . . ? Thanks for this lovely account of your whirlwind month! I, too, have had some tense moments in the past with weather reports and boy birthday parties. Phew. That’s a nail-biter for sure! This has been the fastest year I’ve experienced – and I’m relieved to hear it’s not just that way in my world! I’m telling you, although I’m sure you already know, those boy birthday parties are different than girl birthday parties! 🙂 Thanks for being here, Michele! Blessings to you, Kristin! Have a great rest of the week! Full and full of memories – indeed! The birthday party did end well – and looked nothing like I expected! But he didn’t care! 🙂 Enjoy your week as well, Gayl! We are surprising the kids at Christmas with a trip to Disney in January and I just can’t wait! They’ve never been and have no idea. Glad you all had a fun time in the cruise! It is so good for my soul to document life, and the goodness, especially. But I’m glad I’ve documented hard seasons too because God’s faithfulness always manages to show through, at least in hindsight. 🙂 We surprised our kids with a Disney trip two years ago and it was such a hard secret to keep, but their faces when we got in the car that morning were worth it. Such a fun time! I’m glad y’all get to do that! I got annoyed with Olivia and crew about that same time. I think I also took a break but then caught back up in time to stay current with last season. I’m interested to see what happens in the new season. I hope your December allows you to slow down! December *looks* like it’s going to be a little less nuts, but there are all those Christmas events I love so much. 🙂 I’m hoping to catch up with Scandal before the new season starts – we’ll see if that happens! Thanks for being here, Katie! I enjoyed reading about your busy month. The Disney cruise sounds great and I’m glad you benefitted from the social media break. Thanks, Lesley! I’m glad you stopped by here today!